LeBron James wants to address the issue of photographers and videographers sitting too close to the court during games, per a report from Northeast Ohio Media Group’s Chris Haynes. The Cavs star told Haynes he’ll “have some points that will be announced” during the NBPA union meetings in July. James has had multiple incidents with photographers this postseason. In Game 1 of the East Finals, he stepped on a sideline camera man and turned his ankle. 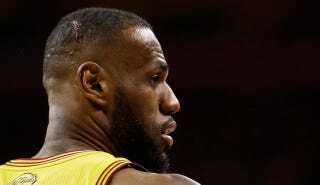 And in a scary moment from Game 4 of the Finals, LeBron cut his head open after crashing into a cameraman on the baseline. LeBron James, NBPA Executive Director Michele Roberts wants courtside photographers moved. LeBron must be really tired of cameras.